iPhone SE colors - which shade should you buy? The iPhone SE may look similar to the iPhone 5S, but it’s a much better phone, with a solid build quality, great internal power and a much improved rear camera. We loved the iPhone SE - we gave it four stars out of five when it initially came out - and it features a premium-feel metal body, with a two-tone color effect on the rear. You've got four different color choices with the iPhone SE – so here’s every option of shade you’ll have when picking up the smaller iPhone. This is a new option for the smaller iPhone range – but it’s the exact same shade you’ve been able to get on the iPhone 6S and iPhone 7. It may not be the shade for everyone, but it's certainly an interesting color choice. The traditional silver shade is available to you on the iPhone SE, and if you’re looking for a light colored phone this is probably the best option to go for. Space Gray is back for the iPhone SE as well. If you're looking for a darker shade on your 4-inch phone, this will be the one to go for. The last color option available to you is a gold iPhone SE. This is perhaps the most premium looking iPhone SE color if you’re looking for a little bling on your brand new phone. Don't like the options above? 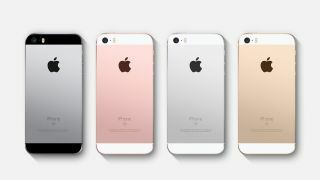 Apple likely won't update the colors of the iPhone SE any time soon, so you're stuck with gold, rose gold, silver and space gray. You could always get yourself a case for the iPhone SE though and you won't have to see the color of the phone much. Here are a selection of our favorite iPhone SE cases. If you choose the right protector for your phone you can make it any color you wish.